Post news Report RSS	We are releasing a video tutorial series on how to play the game. 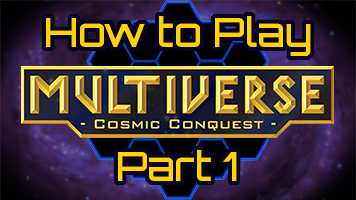 We’re releasing a tutorial series on how to play Multiverse: Cosmic Conquest TCG. You can now play the online beta of the game for free with all the cards unlocked on a virtual tabletop called OCTGN. This is a playlist of tutorial videos that will explain you everything you need to know to start playing Multiverse: Cosmic Conquest. As of now we only have 2 videos published, but expect a new episode every 2-3 days.